RGV FC's Todd Warton heads the ball as Reno 1868 FC's Daniel Musovski looks on during the first half of their game Wednesday, May 2, 2018, at H-E-B Park in Edinburg. RGV FC ended the game 0-0. EDINBURG — Now in their third season with the RGV FC Toros, Todd Wharton and Kai Greene are no strangers to the rivalry with San Antonio FC. Wharton said the matchups are always some of the most physical of the season, and the crowd energy is at its yearly peak. 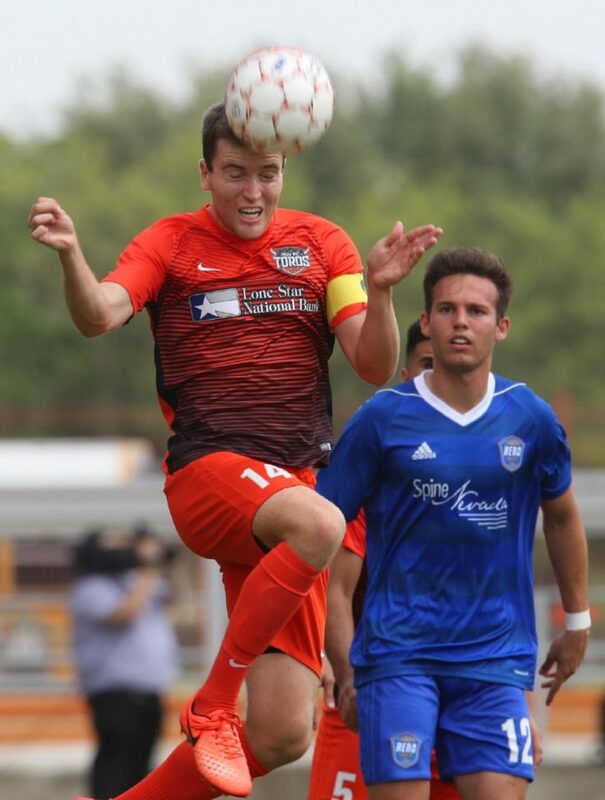 The trio of meetings between RGV FC and San Antonio FC this season, the first of which kicks off at 7:30 tonight at H-E-B Park in Edinburg, will have a fresh twist. Jose Escalante, one of RGV FC’s primary attackers the past two seasons, will be suiting up on the opposite side of the South Texas Derby. Escalante has scored one goal so far this season, playing in five of SAFC’s seven matches. He scored three goals with three assists in 16 matches for the Toros during the team’s inaugural season in 2016, then tallied four goals with an assist in 21 matches for RGV FC while on assignment from the Houston Dynamo last year. In two seasons, RGV FC is 4-2-1 against San Antonio. Through eight of 34 matches, RGV FC ranks tied for 13th in the Western Conference with seven points (1-3-4). San Antonio is tied for eighth with 12 points (3-2-3). Tonight’s match will mark the first time this season RGV FC takes the pitch after only two days of rest. The Toros played to a 2-2 draw with Fresno FC on the road Wednesday. Wharton said the time crunch only mildly impacts the team’s training. The Toros simply need to focus on controlling every factor they can, he added. Echeverry said he and his staff rarely discuss the scheduling challenges with the players so that the grind doesn’t enter their minds. He added that, when necessary, he’ll ask players how they feel and adjust the team’s training schedule accordingly. RGV’s match Wednesday opened a stretch of four matches in 15 days. After San Antonio, the Toros host Swope Park on May 19 and LA Galaxy II on May 23. San Antonio’s roster also includes Mikey Lopez, a 25-year-old native of Mission who was selected No. 14 overall in the 2013 MLS SuperDraft. Lopez leads SAFC with two goals, having appeared in all seven of the team’s matches.